NO CHARGE healthcare for all DPS Students. Find out more! 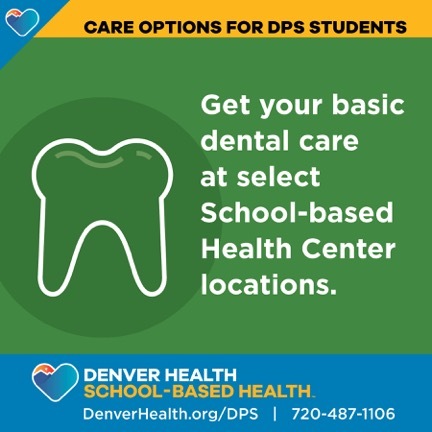 Did you know about Denver Health’s 17 School-based Health Centers (SBHC)? These centers are located on a school campus and are able to provide services such as well child/well adolescent checks, sports, camp and employment physicals, behavioral health and dental services, Immunizations and many more. The SBHCs are operated by Denver Health employees who provide comprehensive onsite health care to all DPS student as well as children enrolled in DPS-affiliated Early Childhood Education programs at NO CHARGE to families. Any DPS student is eligible regardless of insurance or legal status or ability to pay.